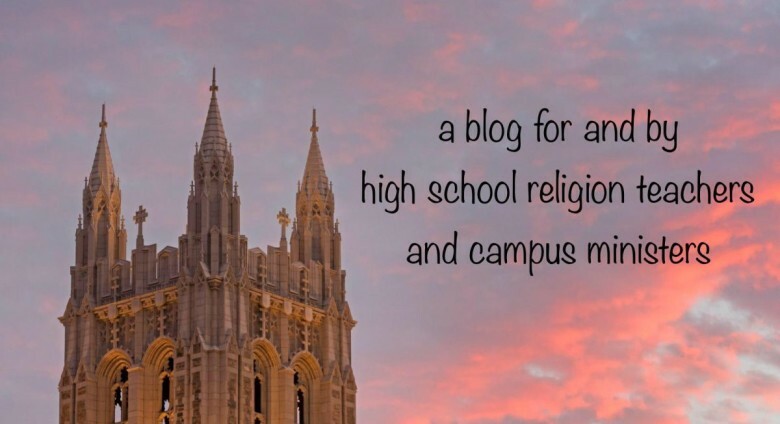 I was invited to write a blog post at For Your Consideration. We are called to evangelize through witness (living out our faith) and sharing (explicitly spreading the Good News). So often our instinct is to examine what else we can do. We focus on the call to conversion and re-evangelizing our colleagues through Faculty Faith Formation. 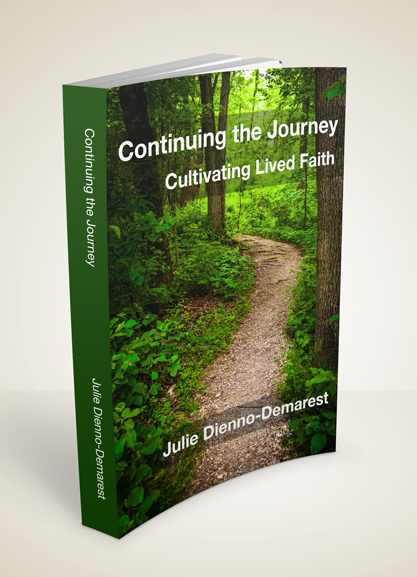 We also have a tremendous opportunity to engage in the “new evangelization” to colleagues who have become distant from the faith by simply naming the ways in which we are already living God’s love in our life, work, and ministry. Pope Francis delivered an incredible homily during his visit to Philadelphia on Saturday morning, at the Basilica of Sts. Peter and Paul. By virtue of our baptism, we are each called to participate in building up the Kingdom of God… to proclaim the Good News… to share God’s love with the world… to share our gifts and talents… to give the reason for our hope (1 Peter 3:15). By virtue of our baptism, we are all called to do something. This is essentially the point of evangelization; kindling our passion for God such that it bubbles over into every aspect of our lives. Young and old, women and men, youth and adults, laity and religious; we are called to love and serve the Lord. We are called to give glory to God by our life. 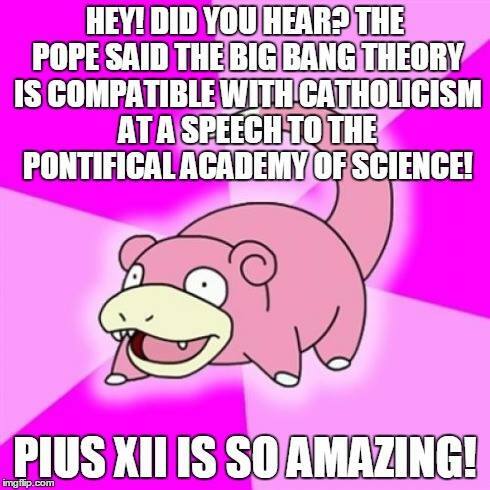 I, for one, am excited and inspired by the Holy Father’s words. On Sunday, October 4th, I’ll be leading a Day of Renewal for the St. Paul Mission Parish at the San Juan Renewal Center in McAllen, TX. We will spend time reflecting on Pope Francis’ (and Pope Leo XII’s) words: “What about you? What are you going to do?” Pray for us! And join us if you can! For the complete text of the homily, click here. 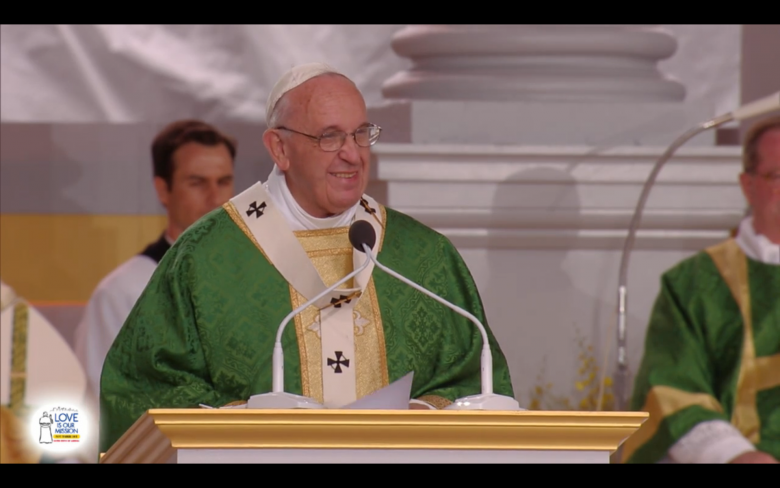 To watch Pope Francis deliver the homily, click here. 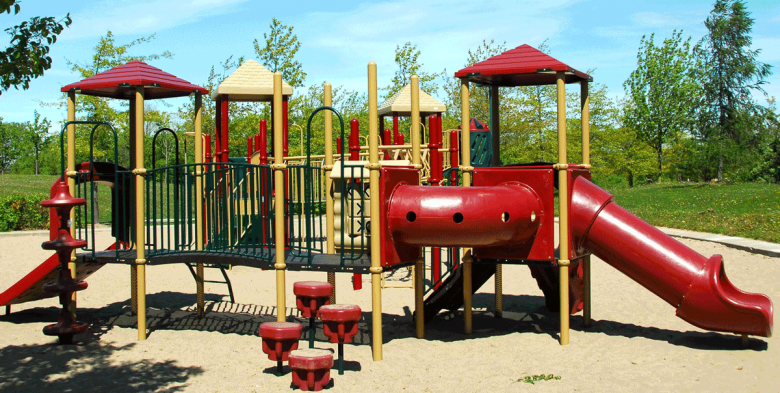 Two Moms go to a playground with their kids, ages 2 – 4. 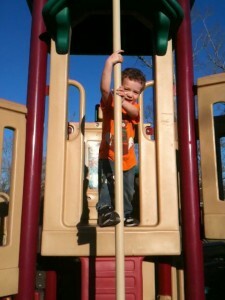 One child asks his mom to help him use the fire pole, so she holds him the whole way down. The second child asks the second mom for help. She says, “I’d be happy to teach you how to do it, but I’m not going to do it for you. Do you want to learn?” Second-Child hesitates before agreeing. Second-Mom explains how to reach out, hold the pole nice and high, then step out while holding on, wrap feet and legs around the pole, and gently loosen the hold to slide down. She guides her son’s grip, holds her hands out to catch him in case he needs it, but tries not to actually do the work for him. By the third try, he’s doing it with enough confidence that she can sit back and watch. The release of the Senate Intelligence Committee’s “Torture Report” brings a slew of articles on the use of torture and the deceit surrounding it. Although the report itself is 500 pages, there are plenty of sites that offer snippets of commentary alongside snapshots of the report itself. It is difficult to read about the details. Even the vague descriptive terms make me squeamish. But I think that’s a good thing. It should be difficult to read. We shouldn’t be desensitized to the details of torture. A visceral reaction to articles about torture reflect our recognition of the evil in the act. Torture is morally wrong. It is discussed in the Catechism in conjunction with the 5th Commandment’s discussion of disrespect for human life and dignity. Torture which uses physical or moral violence to extract confessions, punish the guilty, frighten opponents, or satisfy hatred is contrary to respect for the person and for human dignity (CCC, 2297). Why does the Church teach that Torture wrong? physical or mental integrity of the tortured” (USCCB, Background on Torture). “An evil action cannot be justified by reference to a good intention” — St. Thomas Aquinas (CCC, 1759). 2. The end does not justify the means. People often speculate that torture is justifiable if it ultimately renders information that can save lives, thus asserting that it is a necessary evil. Research has shown (and evidenced in the Senate report) that information gathered as a result of torture is not reliable. But from a moral perspective, the focusing on the reliability of the information misses the point. Morally speaking, we must never do evil to achieve good, nor must we ever try to justify doing evil because good came out of it. We are not entitled to achieve our goals by any means necessary. 3. Do unto others is the Golden Rule (Matthew 7:12, Luke 6:31). Essentially this is the idea that we should not do to others what we do not want them doing to us. This is part of the reason why torture is illegal according to international law and the Geneva Conventions. We cannot condone torturing another human being. As a matter of faith, we must reject this practice. …to sarcasm, because this is actually not new. 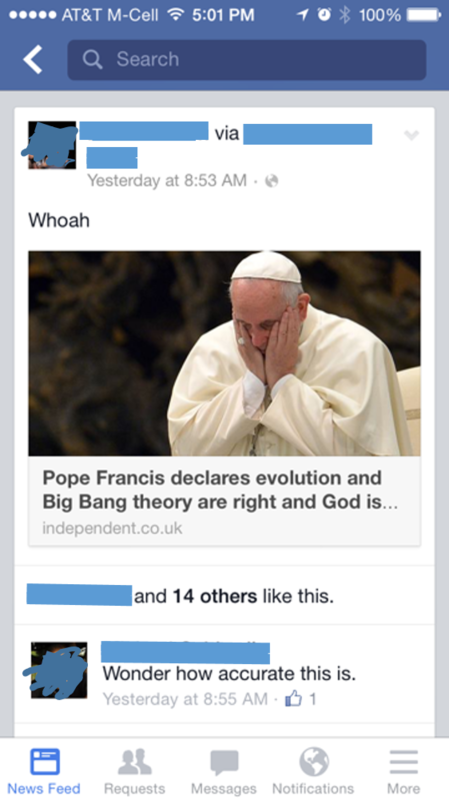 Sarcasm aside, the Catholic Church does (officially) teach that there is no conflict between faith and evolution / the Big Bang theory. Specifically, the Church teaches that Scripture is authoritative only in matters of faith, not science. To put this another way, the Church will speak to the Why of creation, but not the specific details as to the How. Catholic teaching asserts that God created all things from nothing, but does not say how. Explaining how everything came to be belongs to the realm of science. The Church has held this position that there is no conflict between faith and evolution / the Big Bang theory since Pope Pius XII in 1951. Pope Francis made a statement at the Pontifical Academy of Sciences on October 28, 2014. Pope Saint John Paul II made a similar statement to that same group in October 1996. Pope Benedict XVI not only agreed with his predecessor and his successor there is no conflict, he specifically spoke against the idea of teaching “Intelligent Design” as a scientific theory. It is important that popes reaffirm this teaching in continuity with one another because many people still do not know that this is what the Church teaches. So, of course Pope Francis made the statement! 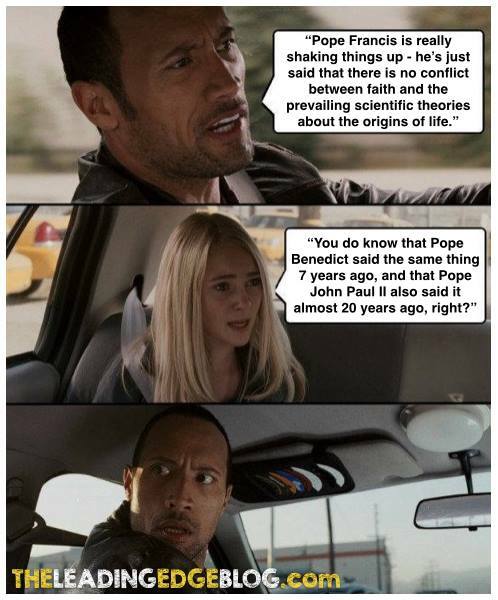 But no, Francis did not disagree with Benedict, nor is Francis’ statement in stark contrast to Benedict’s. There is continuity, as there should be. In 2006-2007, during Pope Benedict’s papacy (2005-2013), there was a heated discussion about teaching Intelligent Design and/or Creationism alongside the theory of evolution and the Big Bang Theory. Concern arose because proponents wanted to teach Intelligent Design and/or Creationism as alternative scientific theories. “Intelligent Design Theory” attempts to be a form of science, redefining science to accept miraculous explanations; Creationism specifically uses the bible as a source of scientific authority. Good theology understands God’s role in creation, but that’s theology, not science. Believing in an “unmoved mover” or “superior cause” or “intelligent designer” is theology, not science. The Church grants science the rightful domain of explaining the origins of the universe, but acknowledges God’s guidance in some way (and does not define what that “way” is). Recognizing that it speaks with authority in matters of faith, not science, the Church does not officially endorse any one specific theory. However, the Church does recognizes the overwhelming scientific evidence supporting the Big Bang Theory and evolution, and officially states that creation and evolution are not contradictory (the faithful do not need to choose one or the other).